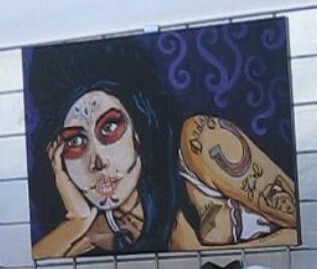 Amy is just one of many celebrities who are now celebrated during this unique festival that traces its roots back to the days of the Aztecs. More than that, it is a celebration of family and friends who have passed on but who are brought out and celebrated once more during this special day. Not in the literal sense today, though in the past it was the skulls who were brought out and painted bright colors during this event. This Wikipedia article is a rich source on the history of this festival, the various ways it is celebrated in different parts of the world: History of Dia de los Muertos! Still, it is a very joyous occasion, no time for tears....the dead are brought out to be remembered with their favorite foods, cherished toys, favorite songs, and other remembrances....never to be forgotten.